Zirconium tetrachloride was synthesized from the reaction between zirconium metal and chlorine gas at 300 °C and was analyzed by electron impact mass spectrometry (EI-MS). Substantial fragmentation products of ZrCl4 were observed in the mass spectra, with ZrCl3 being the most abundant species, followed by ZrCl2, ZrCl, and Zr. The predicted geometry and kinetic stability of the fragments previously mentioned were investigated by density functional theory (DFT) calculations. Energetics of the dissociation processes support the most stable fragment to be ZrCl3 while the least abundant are ZrCl and ZrCl2. Zirconium chloride is of crucial importance in numerous research fields and industrial applications such as unconventional catalysis , refining of Zr-containing ores by Kroll reduction , chemical vapor deposition , and nuclear engineering [4, 5, 6]. Chlorination has been proposed for large-scale separation and selective recovery of Zr as ZrCl4 from U–Zr alloys or used nuclear fuel cladding [4, 5]. Due to the presence of impurities (e.g., Sn, Cr, Fe, etc.) in the recovered ZrCl4, further efforts are necessary to improve the purification process. This requires fundamental understanding of the materials during each stage of the process. Starting materials consist of Zr cladding such as Zircaloy-4, Zircaloy-2 and Zr–Nb alloys (Zirlo™ and Zr-2.5Nb) while the final product should be Zr metal. In the chlorination process, the intermediate material is ZrCl4. Our previous efforts have been devoted on fundamental studies of the starting materials described above , followed by ZrCl4 [8, 9]. Therefore, an accurate knowledge of zirconium chlorides is crucial for efficient separation and selective recovery of Zr from cladding materials. While much attention has been given to the theoretical and experimental investigations of crystalline ZrCl4 , accurate structural and thermomechanical information of ZrClx (x = 1, 2, 3, 4) molecular species remains scarce. Due to their chemical similarities and the importance of the refinement process in the nuclear industry, studies on gaseous ZrCl4 are typically performed in conjunction with HfCl4. The first electronographic approximations calculated the theoretical intensity curves based on the intermolecular distances in ZrCl4 (i.e. Zr–Cl = 2.32 Å and Cl···Cl = 3.79 Å) and in HfCl4 (i.e. Hf–Cl = 2.33 Å and Cl···Cl = 3.80 Å) . Recently, Barnes et al. reported that the vapor pressure of ZrCl4, FeCl3, CrCl4, NbCl5, and NbOCl3 are very similar at temperatures near 330 °C . The vapor pressure of ZrCl4 has also been measured under vacuum and under argon atmospheres . In addition, DFT models have been used to predict the volatility and adsorption enthalpies of ZrCl4, ZrOCl2, and ZrCl62− salts in comparison to the other Group IV metal chlorides. These models are for the most part in disagreement with experimental data , demonstrating the complexity of these gas phase interactions. As for gaseous ZrCl2, the structure, vibrational frequencies, and heat of formation have been predicted, and they are in close agreement with experimental data . 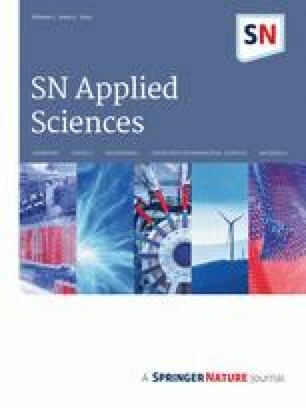 In this study, we have carried out combined experimental and computational studies to investigate the structures, electronic properties, and relative stability of the ZrClx (x = 1, 2, 3, 4) molecules in the gas phase. Zirconium metal sponge (> 99% purity), and a lecture bottle of chlorine gas (> 99.5% purity) were obtained from Sigma Aldrich and used as received. The clamshell furnace was a Lindberg Blue M Mini-Mite. ZrCl4 was synthesized from the reaction of zirconium metal and chlorine gas at 300 °C in a glass sealed tube according to the method reported in the literature . After the reaction, the end of the tube containing ZrCl4 was placed in liquid nitrogen and the tube was sealed to separate the zirconium oxide impurity. The capillary was then checked for external contamination and sent to the University of Zurich. At the University of Zurich, the sealed tube was stored in an inert atmosphere (N2) glove box. The tube was opened in the glovebox and ZrCl4 samples were placed in sample holders. The samples were then transferred to a Schlenk flask and sealed. The sample was introduced into a glove bag system, which was installed in front of the mass spectrometer and included the sample inlet. The system was evacuated and then purged with argon three times before opening the Schlenk flask. The ZrCl4 sample was mounted on the probe, which was then inserted into the mass spectrometer to be measured. Mass spectrometry measurements were performed on a Thermo DFS (ThermoFisher Scientific, Bremen, Germany) double-focusing magnetic sector mass spectrometer (geometry BE). Mass spectra were measured in electron impact mode at 70 eV, with a solid probe inlet, source temperature of 50 °C, acceleration voltage of 5 kV, and a resolution of 7000. The instrument was scanned from m/z = 30 to 800 at a scan rate of 2 s per decade in the magnetic scan mode, and temperature ramp rate was 60 °C per minute until 400 °C was reached. 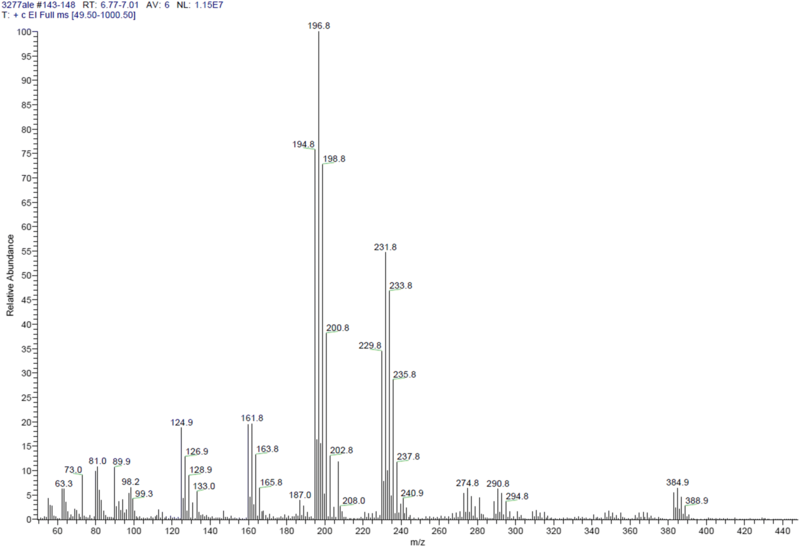 Perfluorokerosene (PFK, Fluorochem, Derbyshire, UK) was used for mass calibration. First-principles all-electron calculations of the total energies and optimized geometries were performed using the density functional theory (DFT) as implemented in the DMol3 software . The exchange correlation energy was calculated using the generalized gradient approximation (GGA) with the parametrization of Perdew and Wang  (PW91). Double numerical basis sets including polarization functions on all atoms (DNP) were used in the calculations. The DNP basis set is comparable to 6-31G** Gaussian basis sets. In the generation of the numerical basis sets, a global orbital cutoff of 3.7 Å was used. The energy tolerance in the self-consistent field calculations was set to 10−6 Hartree. Optimized geometries were obtained without symmetry constraints using an energy convergence tolerance of 10−5 Hartree and a gradient convergence of 2 × 10−3 Hartree/Å. Zirconium chloride species yield EI-MS peaks that are recognized not only by their mass to charge ratio, but also by their unique splitting pattern due to the isotopic abundances of Zr and Cl (Table 1). The spectrum after a retention time of 6.86 min (400 °C) is presented in Fig. 1. The relative abundances of the observed species were determined from the sum of all the peak counts in the isotopic mass range. In addition to the parent ZrCl4 molecule, the following fragments are present in a quantifiable manner: ZrCl3+, ZrCl32+, ZrCl2+, ZrCl+, and Zr+ (Table 2), with ZrCl3 clearly as the most abundant species. It is noted that ZrCl3 is also found in the separation of HfCl4 from ZrCl4 using molten salts . The presence of ZrCl42+, ZrCl22+, and ZrCl2+ is also noticed in the EI-MS spectra of ZrCl4 while the dimeric species Zr2Cl7+ (m/z ~ 425)  could not be identified in our experimental conditions. A previous EI-MS study on ZrCl4 by Schäfer detected the fragments: ZrCl32+, Zr+, ZrCl+, ZrCl2+, ZrCl3+, and Zr2Cl7+. Also, the mass spectra revealed dimerization of ZrCl4 to (ZrCl4) 2 + with a (ZrCl4) 2 + /ZrCl4+ ratio of 0.000401 at 459 K . Our data supports the favorable formation of the lower mass fragments. Interestingly, fragments with m/z ratios higher than the mass of ZrCl4 are also observed at m/z ~ 385 but those ratios do not agree with any of the previous findings or with the sum of any combination of Zr and Cl atomic masses. Systematic studies to investigate the stable geometries of the neutral and ionic ZrClx species has been carried out using density-functional theory (DFT), as implemented in Dmol3  within the level of DFT-PW91 , as summarized in Fig. 2. The theoretically optimized geometries indicate that ZrCl is a linear molecule with Zr–Cl = 2.37 Å. It is worth noting that the predicted ZrCl2 is in C2v with an average Zr–Cl = 2.38 Å. The optimized structure of ZrCl3 is planar in C3v with Zr–Cl = 2.35 Å. The gaseous ZrCl4 is stabilized in the tetrahedral (Td) structure with Zr–Cl = 2.34 Å, which is nearly identical to the 2.32 Å and 2.33 Å previously reported for ZrCl4 and HfCl4 . 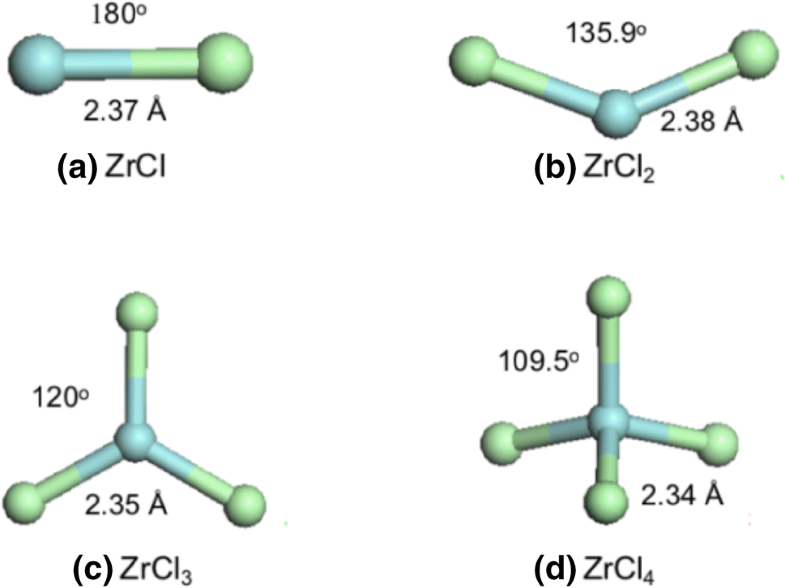 The Zr–Cl bond distances of the respective ionic forms are slightly shorter, 2.29 Å (ZrCl+), 2.30 Å (ZrCl2+), 2.32 Å (ZrCl3+), and 2.36 Å (ZrCl4+), decreasing by no more than 0.08 Å with respect to the neutral species. The most noticeable change in geometry occurs in the ZrCl2 bond angle, 135.9° in the neutral form and 110° in the ionic form. The kinetic stability of these ZrClx species was evaluated in terms of the energy gap between the highest occupied molecular orbitals (HOMO) and lowest unoccupied molecular orbitals (LUMO). The calculated HOMO and LUMO for ZrClx are presented in Fig. 3. The top and bottom panels depict the HOMO and LUMO of the molecules, respectively, indicating that the major contribution to HOMO of ZrCl2, ZrCl3, and ZrCl4 is from Cl-p orbitals while its counterpart to LUMO is mainly from Zr-d orbitals. The calculated HOMO–LUMO gaps are 0.46 eV (ZrCl), 3.84 eV (ZrCl2), 3.53 eV (ZrCl3), and 4.35 eV (ZrCl4), suggesting ZrCl4 to be the most stable species and ZrCl the least stable species. The HOMO–LUMO gaps of the corresponding ionic species are 3.98 eV (ZrCl+), 3.44 eV (ZrCl2+), 3.21 eV (ZrCl3+), and 4.39 eV (ZrCl4+), respectively. A substantial amount of charge transfer from Zr to Cl occurs in these molecular species, 0.47e (ZrCl), 0.47e (ZrCl2), 0.43e (ZrCl3), and 0.36e (ZrCl4). Charge transfer of the corresponding ionic species is estimated to be 0.26e (ZrCl+), 0.23e (ZrCl2+), 0.21e (ZrCl3+), and 0.13e (ZrCl4+). 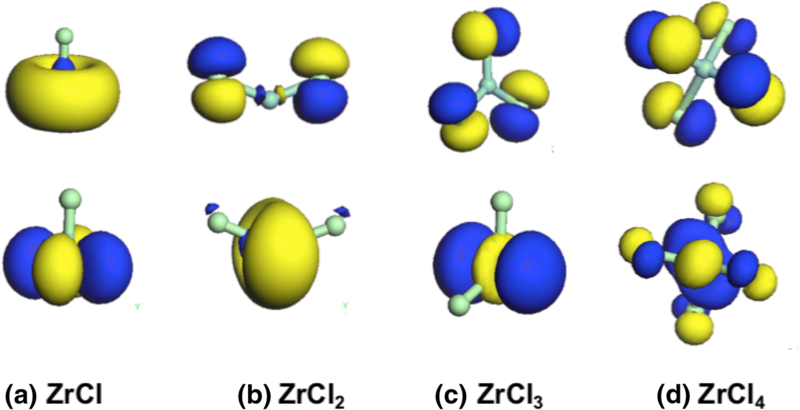 The difference in charge transfer shows that Zr–Cl bonds are stronger in the neutral species. The calculated structural data and energetics of neutral and ionic ZrClx molecules are summarized in Table 3. The EI-MS measurements provide a clear evidence of monochloride, dichloride, trichloride in the gas phase which are due to the fragmentation of ZrCl4. The absence of Zr2Cl7+ in the gas phase might be due to the instability of this species in our experimental conditions. Therefore, the dissociation scenario of ZrCl4 into the lower chloride species has been investigated as follows. 2ZrCl4 → 2ZrCl + 3Cl2, ΔE = 3.81 eV/Cl. It is found that the dissociation cost of ZrCl4 to ZrCl3 is ~ 3.44 eV/Cl while the dissociation cost to produce ZrCl2 and ZrCl are, respectively, 3.71 and 3.81 eV/Cl. These results indicate that the formation of ZrCl and ZrCl2 are the most energetically expensive and that those species are not as abundant as ZrCl3 in the gas phase. In summary, ZrCl4 was synthesized from the thermal reaction between zirconium metal and chlorine gas and analyzed by EI-MS. The EI-MS results indicate the presence of ZrCl4+, ZrCl3+, ZrCl2+ and ZrCl+ in the gas phase. The abundance of ZrCl4 fragments in the gas phase follow the order ZrCl3+ ≫ ZrCl2+ ~ ZrCl+. Previously reported dimeric species (i.e., Zr2Cl7)  have not been observed in our experimental conditions. The structure and energetics of neutral and ionic ZrClx (x = 1, 2, 3, 4) in the gas phase were investigated by DFT methods. The studies of both neutral and ionic species are of interest in the zirconium cladding purification process to explain the formation of ternary compounds, such as ZrFeCl6 , observed in the gas phase. The process by which these intermediate ternary compounds are formed is not well understood, and it could involve both neutral and ionic forms of the chlorides due to molecular collisions at high temperatures. The calculated structural parameters are well in agreement with the one found in the literature. Calculations indicate the energy cost to produce ZrCl2 and ZrCl fragments is higher than the one to produce ZrCl3 which gives a rational explanation to the large abundance of ZrCl3 in the gas phase during EI-MS. The high stability of ZrCl3 in the gas phase indicates that this species could be used in volatility based separation of Zr cladding. For example, the Zr cladding could be initially chlorinated, the resulting chloride species (ZrCl4, metal chloride impurity) would be reduced with hydrogen and the resulting ZrCl3 separated from the chloride impurity after thermal treatment. Similarly, ZrCl3 could be the species that reacts with FeCl3 to form dimeric species, and therefore making iron a difficult impurity to remove. Current works are in progress in our laboratory to develop a process based on purification of Zr cladding involving ZrCl3. This research was performed using funding received from the U.S. Department of Energy, Office of Nuclear Energy’s Nuclear Energy University Program (NEUP) (Grant No. DE-NE0008449). Sandia National Laboratories is a multi-mission laboratory managed and operated by National Technology and Engineering Solutions of Sandia, LLC., a wholly owned subsidiary of Honeywell International, Inc., for the U.S. Department of Energy’s National Nuclear Security Administration under Contract DE-NA0003525. The views expressed in the article do not necessarily represent the views of the U.S. DOE or the United States Government.